Dang – she’s already got eyes on me, still I’m staying put. I wonder if she delivers. 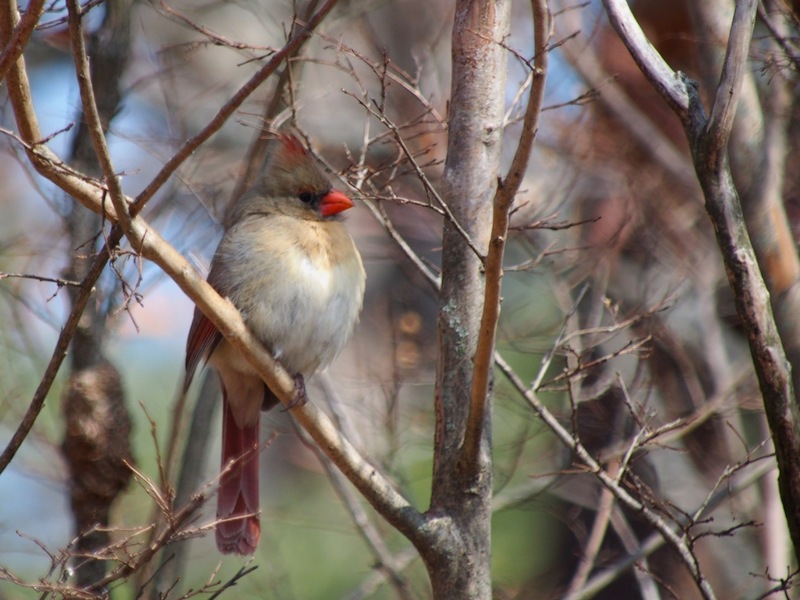 This entry was posted in birds, Ozarks, Photography, wildlife and tagged Arkansas, bird feeding, birding, birds, camouflage, cardinal, female cardinal, Northern cardinal, Olympus, Olympus E-M5, photography by artsifrtsy. Bookmark the permalink. Lovely photos. One of my favorite birds. 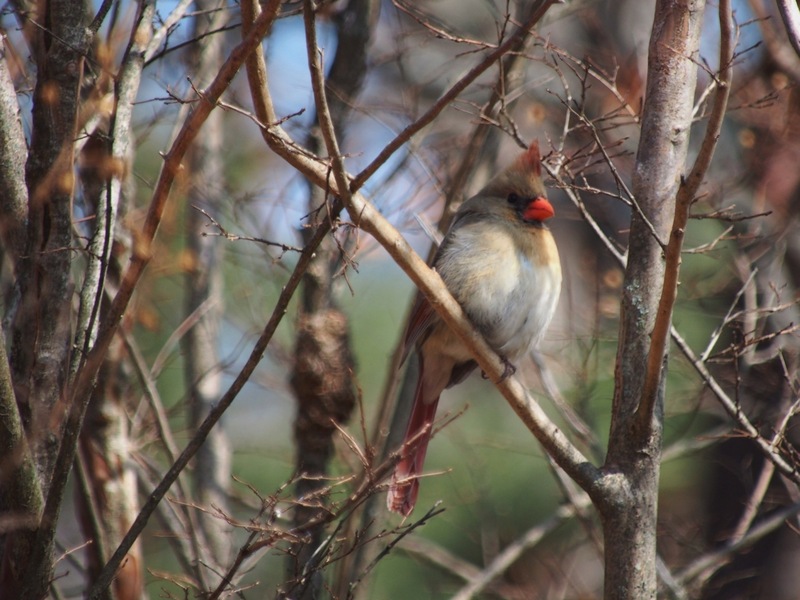 My kids pointed one out in our yard just this morning! They are beautiful little snobs. Actually I’m fortunate to have several pairs in my woods. Hilarious! I love the subtitles…. I’m sure you are right about that – the red gives off such an attitude though. Thanks Bulldog! 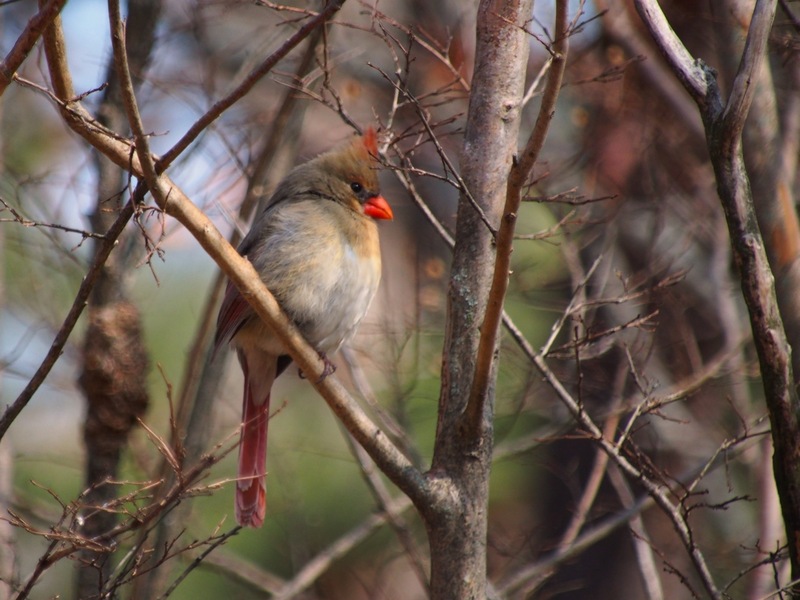 Plumage has always fascinated me and you capture my attention with your images. Thanks so much! 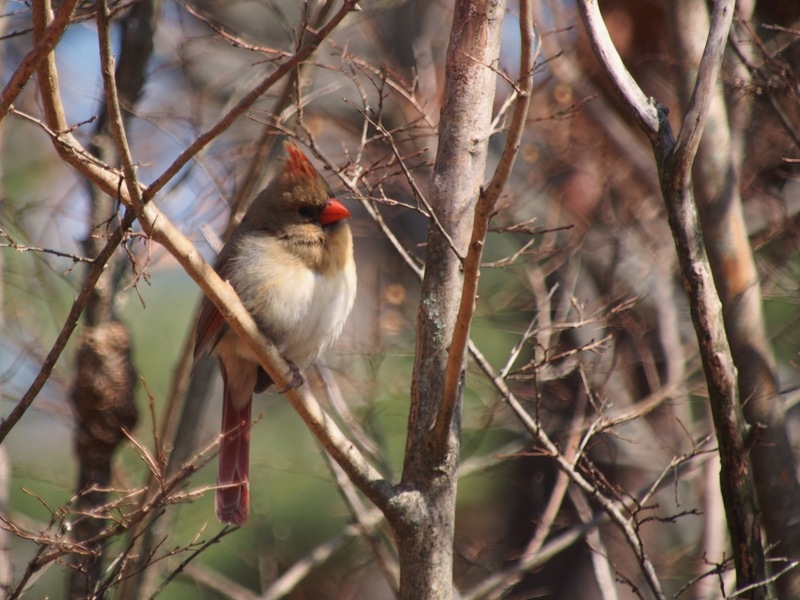 There are definitely more fascinating feathers than those a female cardinal has, but it camouflages nicely. By the way, congrats on being Freshly Pressed again (just noticed). You are becoming a Freshly Pressed machine! Thanks – so funny how a post that you write in a few minutes gets their attention. Probably falls into that life is not fair category on the positive side. It’s impressive that you wrote it in a few minutes since I thot it was good. You know what they say, a little lipstick goes a long way! 😉 Very nice photos. Ain’t it the truth – thank you! I like that little hint of red in her punk hair-do, too. 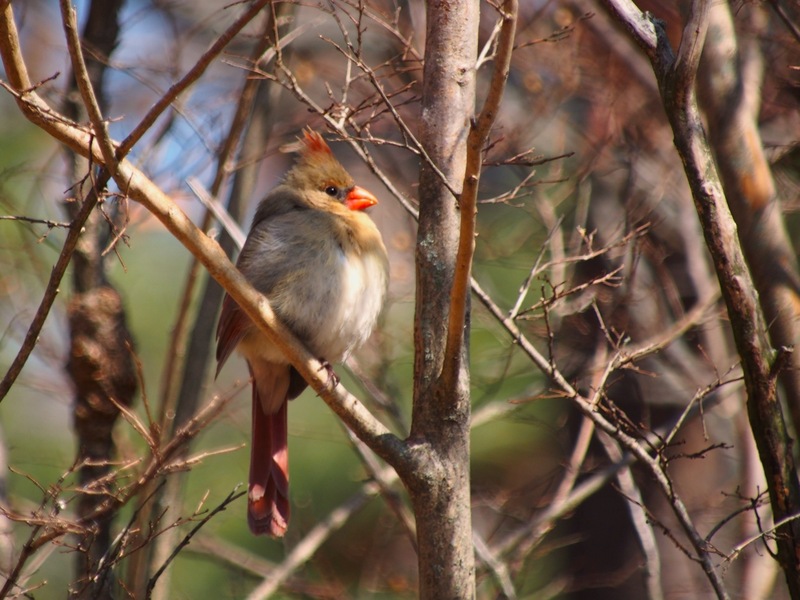 I’m pretty sure female cardinals are perennial teens. Thanks – I’m sure the camo is the reason for her color – his seems to make him so obvious though. In the right light she does very nearly disappear. 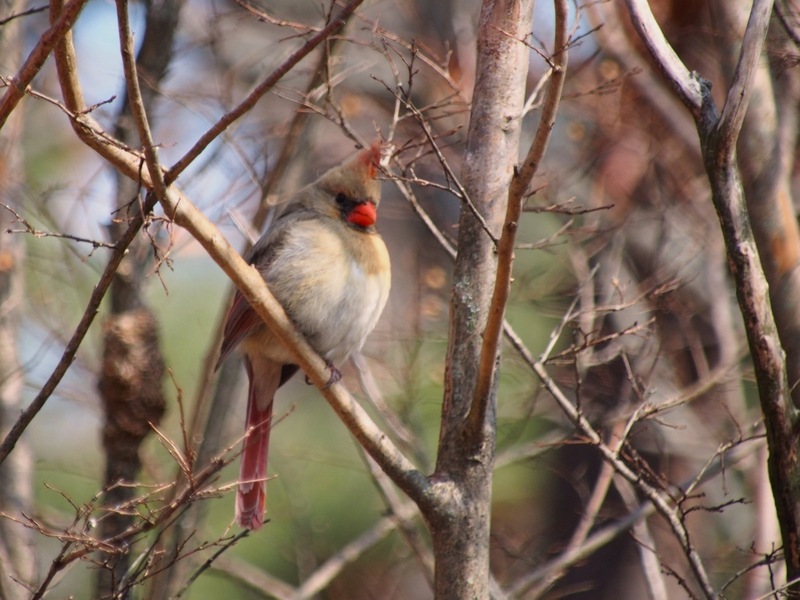 One theory is that the male’s flamboyant red coat announces his presence to other males and may also work to reduce the fighting associated with acquiring and defending a high-quality territory. It is also thought that brightly-colored males have a better chance of attracting a mate. Very little is carved in stone about birds, but it’s food for thought. Lovely pictures. That theory sounds plausible – Maybe it’s just me, but their demeanor seems different. The females were the first to visit the feeders and calmer when there. The males took a very long time to warm up to the idea of eating on my porch. She is one big mama! Sure looks like it. I think that must be why mama wears cammo.